Like King Sejong did four hundred years later with Korean, Emperor Li Yuanhao of the Tangut told one of his advisors to make him a new writing system. Yeli Renrong did, and quickly. Yuanhao must have been more forceful than Sejong, or his elites less powerful, because his new script was more quickly adopted than Sejong’s: schools were set up to teach it and government documents were written in it. To those of us who do not read Chinese characters, Tangut looks kind of like Chinese. To someone who is familiar with Chinese characters, however, Tangut looks unambiguously not Chinese. 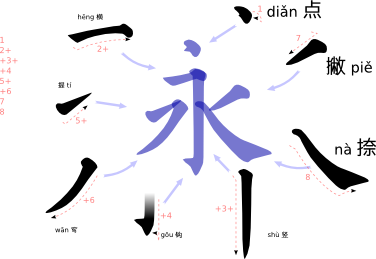 Traditional Chinese script is made up of eight basic stroke shapes, and Tangut uses some additional strokes and the components (“radicals”) look very different as well. This entry was posted in Logograms, Rating: 5 "Whoa!!". Bookmark the permalink.